Take two bright eyes and a button nose, add a butterscotch coat as sweet as syrup, and you have Buddy, brave, beaming Buddy. Barely past puppy hood, he's infinitely gentle and wise, and loves every person he meets. 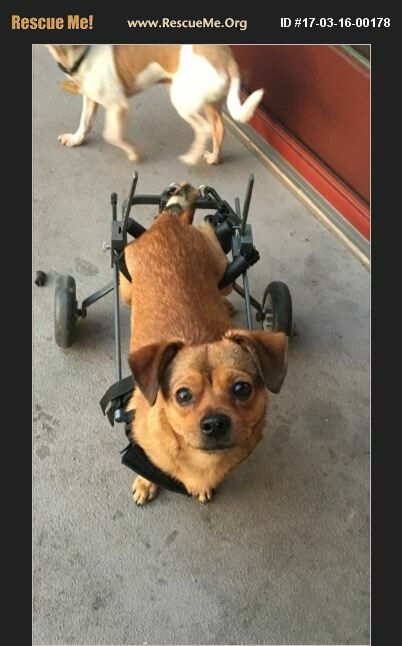 Playful with a capital 'P' despite only two fully functioning legs, Buddy is blissfully unaware of his condition, and with his customized cart effortlessly keeps pace with the other dogs. He does have movement in his back hips, and with daily physical therapy, has been growing stronger, giving rise to the hope that he may ultimately recover some use of those legs. A blend of two luscious lap dog breeds, he's a natural at cuddling on the couch with his foster mom, and when curiosity calls, he's off to explore from the safety of his Drag Bag. Although he must be taken outside to potty and must wear a Tinkle Belt or diapers inside (he's unable to control his bladder), practice makes perfect, and with practice, caring for Buddy will seem as natural as cuddling with Buddy.